Misconceptions are common with any car. Like Corvettes are for retired rich Caucasian men and the Mazda Miata is for girls. Lexus is no different. Many years ago it was more likely than not that the Lexus in front of you was driven by someone older, much older. Not all misconceptions are true, though. This Lexus proves each and every one wrong. No grandmas driving here. No, this is for the sports car lover at heart, the one that waits for the first opportunity to hear that engine roar. No sacrificing luxury, comfort of convenience here, just a stunning and powerful sports coupe. 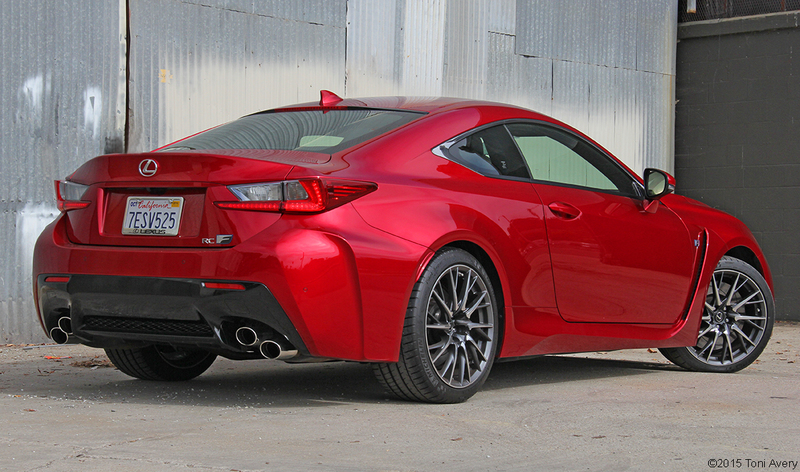 This Lexus is equipped with a 5.0 L V8 producing 467 HP @ 7100RPM and 389 lb-ft of torque @ 4800RPM mated to an eight-speed automatic transmission. The driving dynamics and performance impressed the hell out of me. I loved its quick and responsive transmission, especially when using paddle shifting, and the various drive modes made for an even more enjoyable driving experience. Starting with Normal mode, this is set up to give you the best balance of everything from fuel economy to a more quiet ride inside the cabin. Eco mode helps to improve fuel economy via moderate throttle characteristics and also by controlling the air conditioning system. 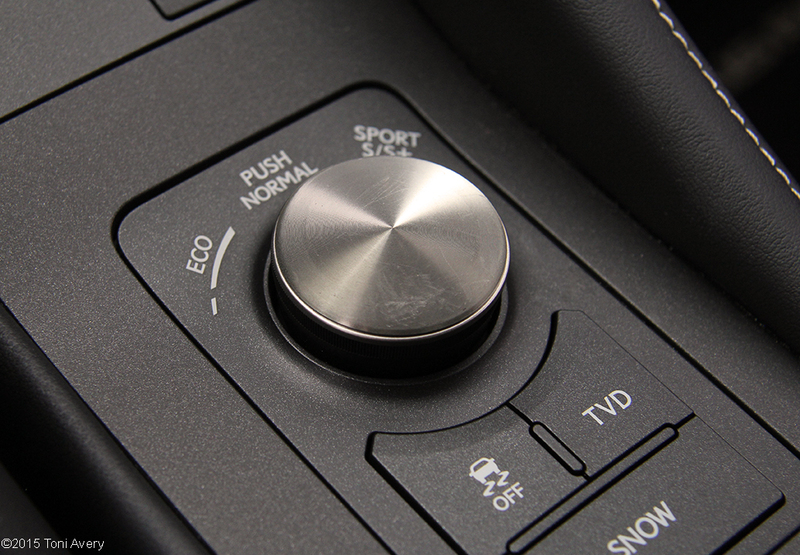 Sport mode increases acceleration/throttle response as well as the transmission shift points for more spirited driving. It’s also quite a bit louder than Eco mode. Sport + is where things really liven up. This mode controls not only throttle and transmission response but also the steering and suspension. Sport + mode offers the loudest and most enjoyable experience you can get outside of applying Expert mode with all the driver assist functions turned off. Leave the car in this mode all the time, even in the city. You’ll go through gas like its water but you’ll have so much fun doing it. As if the drive modes don’t offer enough driving variety, there’s another function called TVD or Torque Vectoring Differential. This offers three different modes from Standard, Slalom and Track. The system distributes driving force, or torque, between the right and left rear wheels automatically. The result is enhanced steering while cornering and increased traction when exiting the corner. TVD is another great feature to have when really pushing the car through your favorite set of twisties although, I do feel that this function would be best utilized on a track where pushing the car won’t get you into any speed restricted trouble and tossing around the rear is allowed and encouraged. Another big plus for me was the quick and accurate transmission. If you’ve read some of my other reviews you’ll know I’m a die-hard manual transmission gal. 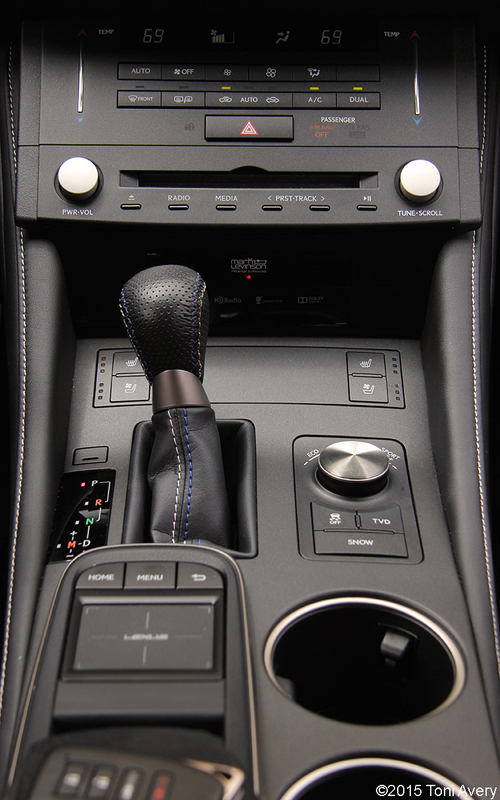 But for an automatic, this transmission is really quick and delivers satisfying and deliberate shifts. To assist in slowing down the RC-F from all this great performance are Brembo six-piston monoblock calipers with 14.9″ slotted and ventilated discs (front), four-piston monoblock calipers with 13.5″ slotted and ventilated discs (rear). These help in slowing and performing complete stops from high-speeds without protest. The exterior of this RC-F is finished in Infrared featuring the optional Premium Triple Beam LED Headlamps, optional 19” Hand Polished 20-Spoke Forged Alloy Wheels and standard Speed Activated Spoiler. 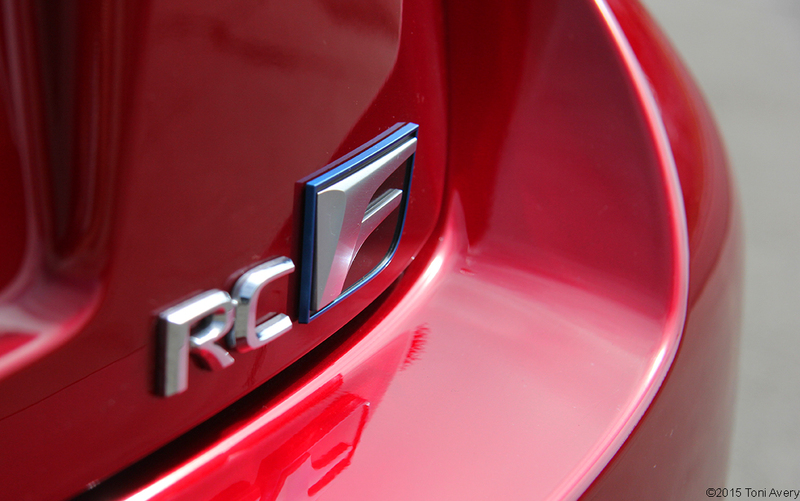 On the outside, the RC-F is just as aggressive as its performance. The front is very aggressive with a large grille and sculpted edges and angles. At the rear the car is still edgy in its styling but not nearly as much as the front. The quad exhaust, two pipes on either side, really cements its high-performance nature. The Speed Activated Rear Spoiler is a very cool feature that not only looks good but also helps improve aerodynamics while driving. Depending on your speed (around 50-80 MPH depending on the drive mode) or if the spoiler button is pressed manually at speeds above 12 MPH, the spoiler will raise and also retract at lower speeds or if the button is pressed manually. An optional package that adds some additional pizzazz is the Performance Package. This adds some features already seen in the Premium Package (equipped on this car, see interior section below) as well as a very cool carbon fiber roof and Speed Activated Spoiler. 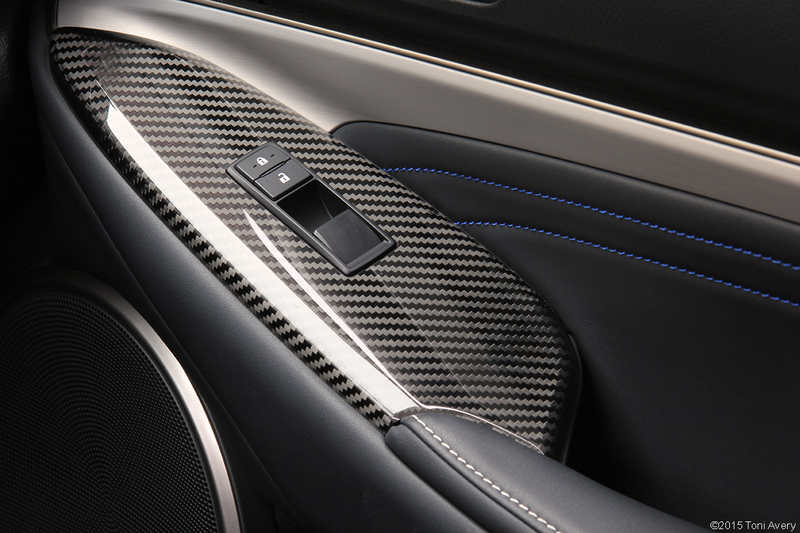 Advantages of carbon fiber parts include a strong yet light structure. With cars today ever-increasing in curb weight, manufacturers are working hard to find ways to reduce weight in places on a vehicle that best effects handling and driving dynamics. 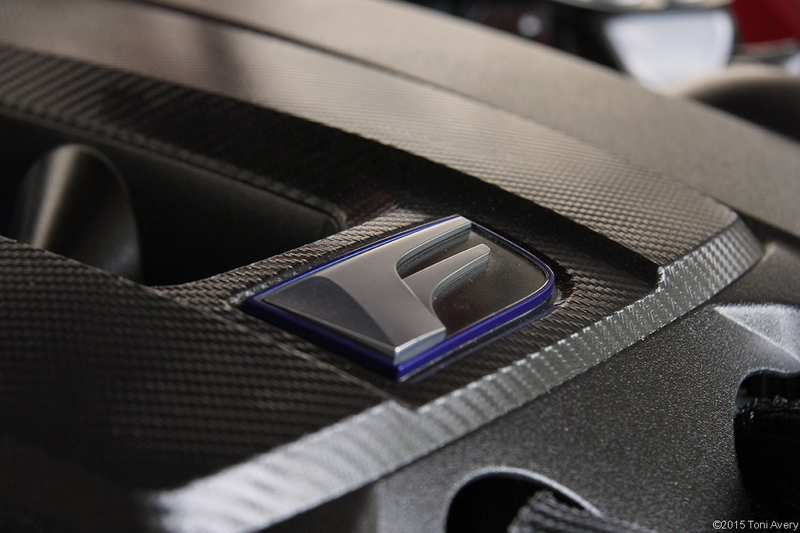 If equipped, this carbon fiber roof only reduces the RC-F’s weight by 12-13 pounds from 3958. Not enough to justify spending an additional $5500 for this and other options seen in the Premium Package. Inside the RC-F is the optional Navigation/Mark Levinson Package (including Navigation, 5.1 Surround, 17-Speakers and 835 Watts, Backup Camera, Remote Touchpad Controller, Lexus Enform Destinations, App Suite, Voice Command, Lexus Insider), optional Premium Package (including Heated/Ventilated front seats with Driver Seat Memory, Carbon Fiber Trim, Blind Sport Monitor, Rear Cross-Traffic Alert, Intuitive Park Assist, Rain-sensing wipers, and Auto dimming mirrors with reverse tilt). The interior is just gorgeous will all kinds of high-end materials including leather, Alcantara, and carbon fiber. The optional leather seats are very comfortable and hold you like a Recaro. While the heat/ventilation function is nice to have, it didn’t work as well as I expected. I could do without that feature in this car. The rear seats are comfortable as well but are difficult to get to. The trunk is actually pretty large and can fit a good amount of luggage for a several day getaway. I really liked the touch pad feature as it worked just like a smart phone with only your touch needed. There is little to no plastic to speak of and the overall fit/finish and textures in this car are second to none. 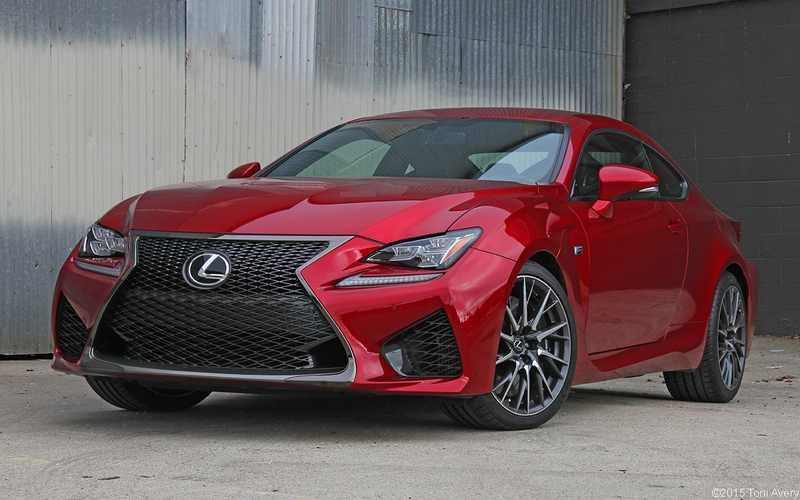 The 2015 Lexus RC-F Coupe proves that the automaker deserves and is more than capable of holding its own in the sports coupes realm. Bravo Lexus, this is one great machine.